No other quality bed liner on the market today offers better protection than the DualLiner 5-piece bed liner system, which is why DualLiner has so many positive bedliner reviews. 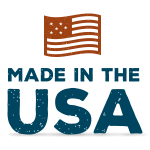 Much of what makes our product second to none is our OEM-quality design and bed liner manufacturing process. 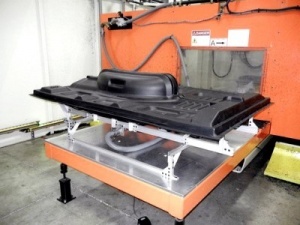 This process ensures each bed liner we offer is custom-fit to the exact dimensions of the specific Dodge/Ram, Ford, GMC, or Chevrolet truck bed it is meant to protect. Plus, our bed liners are 100% Made in USA (in other words, we didn’t have to fly to China to take these photos!). We start with a digital rendering of the truck bed. Through our manufacturer partnerships with Ford, FCA-US, LLC (Ram Trucks) and General Motors, we receive the exact same CAD design files that are used to produce the actual body panels of the truck itself. We then model a second skin over the virtual panels and add a channel along the bottom for our ZeroSkid rubber bed mat along with provisions for model specific options such as LED lights or additional tie-downs. Occasionally, when the design files for a truck are unavailable we use a state-of-the-art laser measuring system to reverse engineer a digital copy of the truck bed to model our new design. 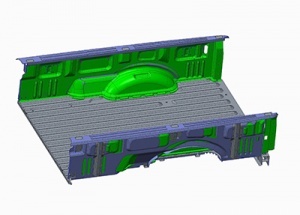 Once our preliminary design phase is complete, we then stress-test our model virtually and analyze the results with a heat map to make sure it offers exceptional protection to the truck panel underneath. We precision-mill a prototype tool using our initial design. After our initial bedliner design is modeled and analyzed, we create a CNC machined wood form using a preliminary tool layout. We create the first few prototype samples of each new DualLiner from this form, inspect them for defects, and test fit them into real-world vehicles. With the precision of Computer Aided Design (CAD) systems, the old fashioned process of manual prototyping is unnecessary for new DualLiner bed liner designs. This method of production is for better quality control and to ensure we get every detail perfect. If necessary, we can make any adjustments for fit or to accommodate new truck box options before we go into full-scale production. 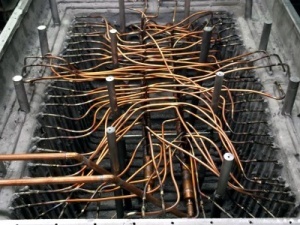 Internal cooling lines eliminate warping. Once our prototype is test fitted and our design finalized, we use our CNC prototype form to create the final pressure-cast aluminum tool for full-scale production. This tool is a mold in the exact final shape of the bedliner. During the manufacturing process the raw materials are heated to a high temperature. Since heat is part of the manufacturing process, this aluminum tool is cast with internal cooling lines, channels, seals and supports so that the tool maintains consistent and manageable temperature during production. Maintaining consistency during the manufacturing process eliminates the chance of warping for the final product. This creates a high quality bed liner. 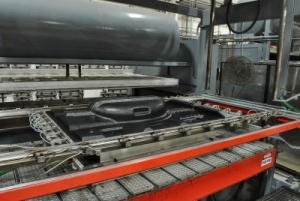 After the aluminum form is cast, we get the tool ready for high volume bed liner manufacturing. For the impact-resistant sides of each DualLiner bedliner we use recycled utility-grade polyethylene with added UVA and UVB inhibitors to protect it against damaging ultraviolet sunlight. Each sheet of polyethylene is loaded into our rotary thermoforming machine, precisely heated in a giant oven to a precise temperature until pliable, and then stretched over the aluminum tool to take shape. While the hot sheet is stretched over the aluminum form, a vacuum is applied to remove all trapped air between the tool and the sheet. The vacuum also helps to pull the polyethylene sheet into the fine details of the tool to perfectly fit the truck bed. 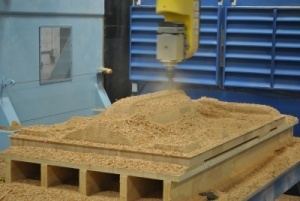 After the newly-formed bed liner has cooled, it is removed from the aluminum tool and sent to a computer-guided robotic CNC trimming machine which has been computer programmed to trim the rough bedliner to exact final dimensions. A robotic arm with a precision trimmer removes all excess material from the sheet and separates the sides from each other. The robotic trimmer then makes any holes for tie-downs and light cut-outs to complete the DualLiner components. Excess polyethelene material gets recycled. 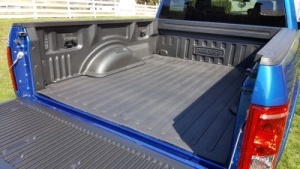 The tough ZeroSkid rubber mat is another differentiating feature of each and every DualLiner bed liner. 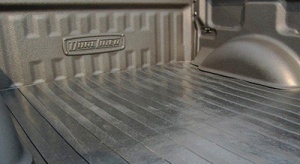 This thick mat not only makes sure that both your bed and your cargo are protected from impacts, it also keeps whatever you put in the back of your truck in place so it doesn’t slide into the sides of the bed while you’re driving. To make the rubber mat, we use compressed radial tire rubber material and an added recycled rubber “cake” to enhance pliability of the rubber. A nylacord mixture is then added as well to improve durability and tensile strength. These components are then mixed and compressed into the tool. Again, we use OEM approved tooling for our rubber floor but we take an extra step and add a finish coating to improve the rich black color of the rubber. This coating also contains UVA and UVB inhibitors to add to the UV resistance of the rubber once the mat is finished. This is why DualLiner bedliners still look great years after exposure to the sun. The entire process to design and develop each new DualLiner bed liner, from concept to full-scale production, takes about six to eight months. There isn’t another bed liner system on the market today that comes close to DualLiner’s commitment to quality and guaranteed perfect fit for the bed of your truck.